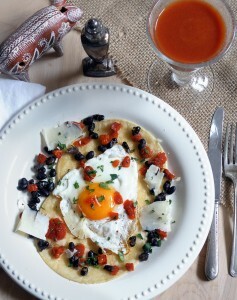 Spring Egg Dishes and Brunch :: Oracibo.com - Food, Travel, Design and Cooking! I like to serve a big, bowl of crunchy greens with savory tarts dressed with lemon vinaigrette, especially in the spring. A pre-baked pie shell. ** I prefer to use a glass pie dish because it gives a crisper crust. However, you can also use a 9″ rimmed, fluted 1 1/4″ deep tart pan with a removable bottom. For a 9” metal, fluted tart pan with removable bottom use: 1 1/2 cups creamo, 3 eggs, beaten, 1 tsp. salt & a rounded 1/4 tsp. pepper. Bring a large pot of water to a boil & add salt. Blanch asparagus for 1-2 minutes or until al dente. Remove from boiling water into a bowl of ice water. Drain & blot dry. In the meantime, sauté the mushrooms in a bit of butter on medium-high until they are lightly browned & release any of their water. Whisk together the eggs and creamo; add the fresh thyme, grated lemon peel, pinch of nutmeg, salt & pepper. Place half the grated cheese into the pie shell along with the well-blotted asparagus pieces & mushrooms, top with remaining cheese. Pour the custard over top until about 1/4″ below rim of pastry (you may have some left over) & place in preheated 375 F oven. 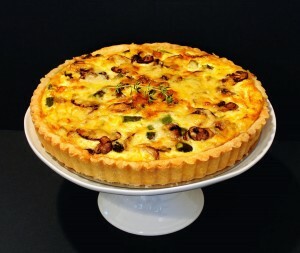 Bake for 30 – 45 minutes, checking after 30 minutes by inserting a thin bladed knife into the middle of the tart. If it is done, the knife will come out clean. Remove from the oven & let cool on a rack for 20 minutes before cutting. To see how to trim asparagus, click How To Trim Asparagus & to prepare a pre-baked pie shell, click Making Pie Dough. The batter for these waffles can be made the night before, an especially good thing for brunch entertaining! 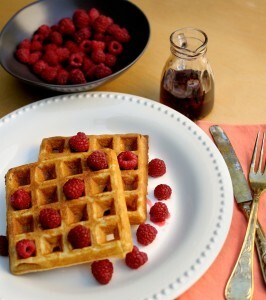 I have included two fruit sauces that are delicious on waffles and we often add a few dollops of yogurt. We also like using fresh fruit and some maple syrup. You can use 1/2 cup whole wheat flour & 1 1/2 cups unbleached flour. Sift & measure the flour; sift again with baking powder, baking soda, salt & sugar. 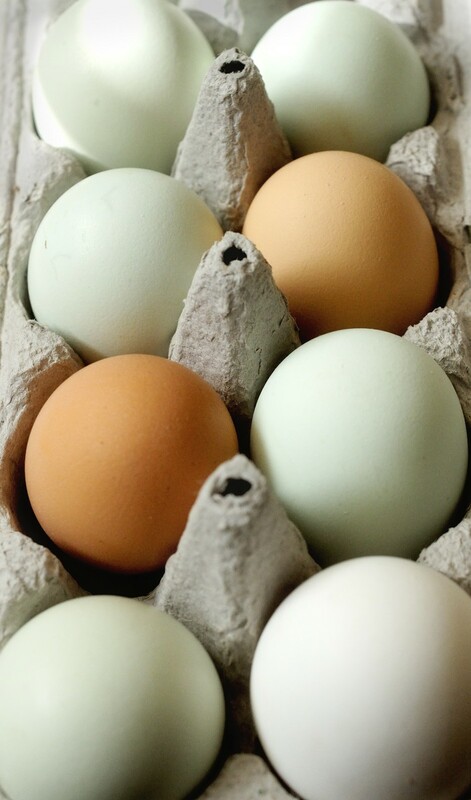 In a large bowl, beat the eggs until light & lemon coloured. Slowly mix in the buttermilk. Add the dry ingredients and blend well. Mix in the melted butter. Place ¼ of the batter on the waffle maker, close & bake until lightly browned & crisp. Remove and place on a large baking pan and put in a preheated 180 F oven to keep warm while finishing the rest of the waffles. Continue baking the rest of the batter in the same way. NB: the waffles freeze very well. Just thaw, pop in the toaster on medium heat until they crisp up. Here are two of my favourite fruit sauces that I try & make when the fruit is in season to serve with the waffles but you can use really good frozen berries. Or…you can just throw some fresh, in season berries on top. I like to top off the berries with some plain Greek style yogurt. However, if I were making these for my Mom….nothing else will do but heaps of whipped cream with the berries. Both sauces will keep, in the fridge for about 1 week. Otherwise, freeze for using later. Strawberry Sauce – can be made up to 4 days ahead & you can reduce the recipe by half. Make sure to use in-season, local strawberries. They simply cannot be beat for both taste & colour! * If you think this would be too sweet for your taste, reduce the sugar accordingly. In a large saucepan, bring strawberries, water & orange rind to a boil over medium heat; reduce heat to medium low & simmer, covered for 10 minutes. Stir in sugar, corn syrup & orange juice, return to the boil, turn heat down a bit and continue to boil, uncovered for 10 minutes, stirring often to prevent burning. Remove from heat; place in a bowl & chill until ready to use. Blueberry Sauce – can be made 4 days ahead & you can reduce the recipe by half. In a large saucepan, combine blueberries, apple juice & lemon rind; cook over medium heat stirring & mashing berries a bit, leaving some whole, for about 15 minutes or until mixtures comes to a boil. Gradually stir in sugar and corn syrup and lemon juice. Return to a boil and turn heat down a bit and boil stirring often, for 15 minutes. Remove from the heat; place in a bowl and chill until ready to use. ** If the sauce is a little too thin for your liking, combine 1 Tbsp. cornstarch with 2 Tbsp. cold water, then slowly stir into the boiling sauce for a minute before removing from the heat. **If you think this would be two sweet for your taste, you can reduce the sugar accordingly. To see how to melt butter in the microwave, click Melting Butter in the Microwave. Here’s another do ahead brunch dish for a stress free host, you can be enjoying your Blood Orange Mimosa while brunch is baking! I don’t know about you, but around the holidays when entertaining can get crazy, we need all the do-aheads we can get our hands on. This can be made vegetarian by leaving out the ham. You can either bake in a 13×9″ pan or make 8 individual servings using ramekins. Sprinkle 3 cups cheese in the bottom of a well greased or sprayed 13 x 9 x 2” baking dish. In a large frying pan, cook the mushrooms, onion and red pepper in the butter until the vegetables are tender but not brown; drain well. Cool a bit, then place vegetables on top of cheese. Arrange ham strips on top of vegetables. Sprinkle with the remaining 3 cups of cheese. Cover and chill in the refrigerator overnight. An hour before baking, remove from the fridge. 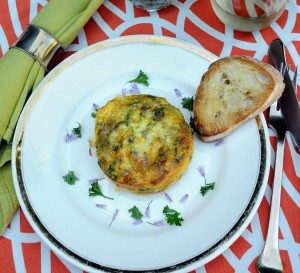 Preheat oven to 350 F. Whisk together the eggs, milk, flour, herbs & parsley. Pour the mixture over the ingredients in the baking dish. Bake for approximately 45 minutes. Let stand 10 minutes before serving. Variations: substitute 3 cups of aged Cheddar for 3 cups of Monterey Jack Cheese. Blood Orange Mimosa: freshly squeezed blood orange juice and bubbly wine! So good! One of our favourite breakfast or brunch plates! For sure, it gets you going! Perhaps for a weekend brunch, with or without guests, maybe a Caesar to kick things off? Drain the soaked beans, rinse & drain; place the beans into a medium-sized deep pot, cover the beans with a mixture of chicken stock & water by 2”; add 1 Tbsp. EVOO, onion, bay leaf, oregano, garlic, jalapeno, tomato & cumin; bring to a boil, reduce the heat to simmer; cover & let the beans cook for 1 ½ to 2 hours, stirring them occasionally. After 1 hour test the beans to see if they are almost done, if so, add 1 to 1 ½ tsp. salt, then continue cooking until the beans are softened but not mushy. Remove from the heat, remove the lid & allow them to cool in their liquid. If you are doing the beans ahead of time, store them in their liquid until ready to use. Heat a small frying pan over medium low heat; add 1 – 2 Tbsp. EVOO & heat until warm; add the drained beans & heat until hot; keep warm in the preheated oven. If you like you can mash the beans a bit, adding some of the bean cooking liquid to make re-fried beans. Meanwhile, place 4 dinner plates in the oven to warm. Have heating a large frying pan over medium-high heat; add some of the EVOO to coat the pan & when hot but not smoking, fry each tortilla for about 1 – 2 minutes per side, adding more oil as necessary. As tortillas are fried, place 2 on each of the plates & keep warm in the oven. Note: you can use 2 frying pans to speed things up. Meanwhile, heat a non-stick frying pan over medium heat; add some EVOO & heat until hot; then fry the eggs the way you like them (yolk should still be runny). Remove the plates from the oven; place an egg on top of the tortillas on each plate, scatter with the beans & chorizo; drizzle with some salsa & top with the grated cheese & cilantro, serve immediately. Note: You can use purchased cooked black beans or refried beans instead of cooking the beans from scratch. The very first time I made quiche was probably in the 1970’s! I had invited a bunch of my “girlfriends” over for Sunday brunch and wanted to make them something none of us had ever had before. 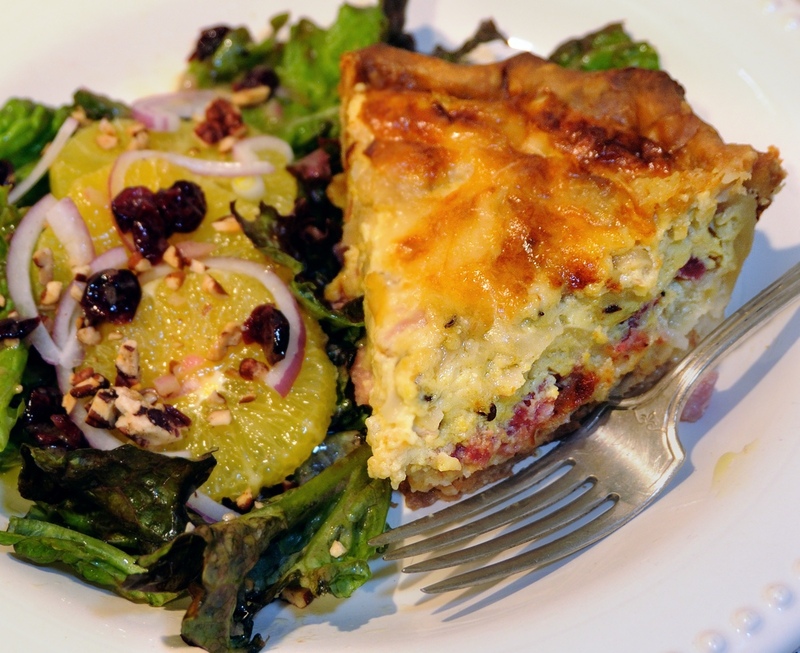 I stumbled upon a recipe for “Quiche Lorraine” in one of my very first cookbooks. In my opinion, it had stood the test of time! For a change, you can use 1/2 to 2/3 cup finely chopped ham instead of the bacon. Prepare the pastry shell: roll out the dough to approximately 11” & fit into a glass pie plate, prick the shell all over with a fork. ( prefer to use glass as it gives a nice crisp crust). Place a piece of baking parchment into the pie shell & fill with pie weights if you have them. (I use dried beans that I save and reuse in case you don’t have pie weights). Bake the shell for 10 minutes; remove the pie weights & paper; if crust appears to be still wet, return to the oven for a few minutes to dry out. If the crust bubbles up, prick lightly with a fork. Remove to a cooling rack & cool completely. Heat a skillet over medium heat & cook the bacon until crisp. Remove to a paper towel lined plate & set aside. Remove all but 1 tablespoon of the bacon fat from the pan, then sauté the onions until just transparent & softened. Remove from heat. Put the diced cheese, bacon pieces & onion in the pre-baked pastry shell. Whisk the eggs together; add the milk, cream, salt, pepper & nutmeg & pour over the ingredients in the pastry shell. Carefully place in the 450 F oven & bake for 15 minutes; reduce the heat to 350 F & continue to bake 15 minutes longer (it will probably be longer), or until a thin-bladed knife inserted halfway between the centre & edge comes out clean. Let the quiche rest for 15 – 20 minutes before cutting. **If you would like to make your own pie crust, please go to “Making Pie Dough”. Crepes do make such a nice brunch. The beauty of crepes is that when you make a batch you use what you need and freeze the remainder between sheets of wax paper for another lovely meal. The crepes can be made ahead and the filling can be made the day before too. So, all that is required is the assembly & baking. However, you may wish to purchase frozen crepes which is OK too! I think crepes make a nice light dinner too; all you need is a salad and for brunch a Mimosa! Although, I am kind of partial to those Bloody Mary’s too! Sift together flour, salt, nutmeg & pepper to taste in a bowl. Whisk together milk, whole egg & egg yolk in a small bowl, then gradually whisk into flour mixture. Force batter through a fine sieve into a bowl. Heat a dry 7 – 8” nonstick skillet over moderately high heat until hot, brush very lightly with some melted butter (or use a crumbled up piece of wax paper dipped in butter to grease pan). Place about 2 Tbsp. batter into the skillet, tilting skillet until coated with batter. If batter sets before skillet is coated, reduce heat slightly for next crepe). Cook until underside is lightly browned, 6 – 10 seconds, then loosen crepe with a spatula and flip over. (I usually lift the crepe up with a thin metal butter spreader until loosened, pick up with my fingers and turn over). Cook until cooked through, about 20 seconds, transfer to a plate. Placing pieces of paper towels between each crepe as they are cooked. Make the remaining crepes in the same manner. In a large skillet, melt the butter over medium-high heat. Add the shallots & sauté approximately 1 minute or until soft. Add the sliced mushrooms, sauté until softened, approximately 5 minutes. Add the chopped porcini & sauté for 1 minute. Stir in the flour & stir for 1 minute. Whisk in the stock & strained porcini liquid; reduce until most of the liquid evaporates, but not completely. Add the cream; simmer until thickened. Remove from the heat, stir in the Parmigiano & season to taste with salt & freshly ground black pepper. Butter a 9 x 13” gratin dish or glass baking dish. Preheat the oven to 350 F.
Place 1 crepe on work surface & put approximately ¼ cup filling in the middle of the crepe & roll up to enclose the filling. Place in the prepared baking dish & continue with filling & rolling the remaining crepes. (If you would like to use individual crepe baking/serving dishes, place 2 crepes in each buttered dish). Top with the remaining mushroom filling & sprinkle with the Gruyere cheese. Place in the oven for 15 – 20 minutes, or until bubbly. Let cool for a 5 minutes, sprinkle with the parsley and serve. (opt.) You can substitute 2 cups cooked diced chicken for half the mushrooms or you could add blanched 1” pieces of asparagus to the mixture. Simply reduce the amounts of the chicken & mushrooms accordingly. **If you would like to make your own stock, please go to Making Stock. This dish makes a lovely, light supper dish served with a salad, or even a brunch dish. Although it may not leap off the page, it is very, very good & I cannot remember how many times I have made it. It’s a winner and it’s vegetarian too! I prefer using the cheese instead of the butter but both are delicious! Sometimes I rub the toast with a cut clove of garlic for a bit of zip. A glass of white wine would not go amiss either! In a large microwave safe bowl, melt the butter in the microware; add the flour; stir until blended. Whisk in the milk and microwave on medium-high heat until it boils & thickens. Preheat the oven to 425F. 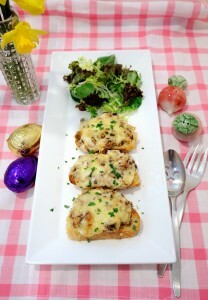 Stir the chopped mushrooms into the béchamel sauce; season with salt & pepper to taste. Rub the toasted bread with garlic & place the toasted bread onto a large rimmed baking sheet. Divide the mushroom sauce between the slices. 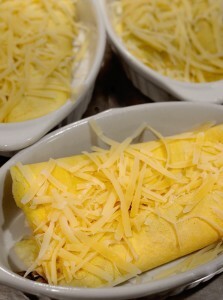 Sprinkle each with some of the Gruyere & Parmigiano Cheeses, or with the butter, if using. Place in the oven for approximately 15 minutes. Note: If you wanted to, you could soak a small amount of dried Porcini mushrooms and add to the bechamel with the brown mushrooms for a more intense mushroomy flavour. **The Easter eggs in this photo are not your everyday chocolate eggs. They come from Beta 5 & they were amazing. One had dark chocolate covered malt balls inside the hollow chocolate egg & the other had dark chocolate covered raisins, rolled in cocoa! AWESOME! A much more attractive way to present sausages & the mustard baste adds a special note. Great for brunch! Best of all, they’re so easy! Combine mustard, herbs, water, soy sauce & tabasco. Seed & cut the pepper into 1” squares. Cut each sausage link in half. 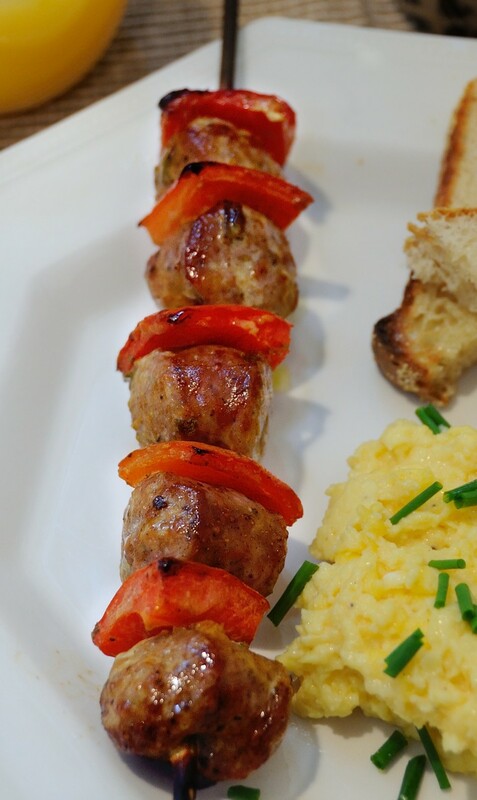 Alternately thread pepper squares & sausages onto each of 8 short metal skewers; place on baking sheet. Brush half of the mustard baste onto the skewers. Broil for 6 minutes or until browned, turn kabobs & brush with remaining baste; broil for another 6 minutes until browned. An excellent way to feed a large-ish group brunch, with most of the work done the day before! Always a good thing in my opinion! You could serve the strata with oven roasted potatoes** and/or sausage patties or sausages, for a hearty brunch; on the lighter side it would be nice to begin with some fruit, followed by the strata. Depends on how hungry your guests are! Heat the EVO in a large skillet over moderately low heat, & sauté the onion, green onions & mushrooms until the onion is softened, add the bell peppers & season with salt & pepper to taste. Cook the mixture over moderate heat, stirring, for 10 – 15 minutes or until all the liquid the mushrooms have given off evaporates & the peppers are tender. Arrange half the bread cubes in a buttered large shallow (4 ½ quart) baking dish, spread half the vegetable mixture over top, then sprinkle with half the Cheddar & Parmigano. Arrange half the bread cubes in a buttered large shallow (4 ½ quart) baking dish; spread half the vegetable mixture over top; sprinkle with half the cheddar & Parmigano. Arrange the remaining bread cubes over the top, top with the remaining veggies, then sprinkle the remaining cheeses over top. In a large bowl whisk together the eggs, milk, Dijon, Tabasco; season with salt & pepper to taste. Pour the mixture over the bread & vegetable layers & chill, covered, overnight. Preheat the oven t0 350F. Remove the strata from the fridge & let stand at room temperature for 15 minutes. Place in the oven & bake for 50 minutes to 1 hour, or until the strata is puffed & golden & cooked through. You can test to see if the strata is done by inserting a thin bladed knife into the centre. If it comes out clean, it’s done. Let the strata stand for 10 minutes before serving. **If you would like to see my recipe for roasted potatoes, please go to Rosemary Roasted Potatoes. These scrambled eggs are a must for breakfast /brunch entertaining & it really works, trust me. I have been making them for eons. I have served them with sausage & red pepper kebabs but you can serve with slices of baked ham, gammon bacon, sausage patties or whatever else appeals to you! Melt 2 Tbsp.of butter in a saucepan over medium heat; stir in the flour; gradually whisk in 1 cup of milk. Stir until thickened & bubbling a bit. Remove from heat & set aside. Melt 2 Tbsp. of butter in a large microwave safe bowl, covered with a piece of wax paper; whisk in the flour; microwave for 1 minute; gradually whisk in the 1 cup of milk; microwave in 1 minute intervals until thickened & bubbling a bit. Set aside. I find this method is sooo much easier! Heck, I have even made the white sauce the night before, covered it & kept in the fridge until the next day. Remove from fridge an hour or so before using. Whisk eggs, salt & pepper & 1/3 cup homogenized milk in large bowl. Melt remaining butter in a large, non-stick frying pan over medium-low heat or non-stick electric frying pan at 320 F. Add egg mixture, stirring & lifting with a spatula while they cook. While still very soft, add the white sauce & continue cooking stirring & lifting; until the eggs are scrambled to your liking. Cover pan loosely with foil & place in a preheated 200 F oven for up to 1 hour. If you have used an electric frying pan, simply place the eggs on a large baking sheet, cover & place in the warm oven. 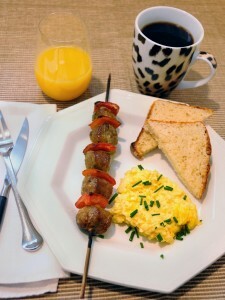 **If you wish to make the sausage kebabs in the photo, please go to Sausage Kebabs.